Beavers: Humanity’s natural ally in combating climate change? Industrious rodent could help in efforts to combat climate change ... if we don't kill them first. Sherry Guzzi wasn’t thinking about climate change eight years ago when she set out to save a family of beavers living near her Lake Tahoe, California, home. A former architect and lifelong wildlife lover, Guzzi was mostly thinking it was just plain wrong to kill animals seeming not to be causing any real harm. She was also thinking about the preschool next door: children there were rallying around their unofficial mascots, hoping to spare the nettlesome beavers from “removal,” the benign term that for many California beavers means death. In the years since then, though, some important things have changed, for better and for worse: one is public perceptions of beavers (better), the other is the state of the climate (worse). The two go hand-in-hand. For her part, Guzzi says she was inspired by the ordeal to launch a nonprofit organization, the Sierra Wildlife Coalition, dedicated to helping people co-exist with beavers and other wildlife in the Tahoe basin. The organization now has a couple hundred members and a core team of dedicated volunteers. Guzzi has also become a self-avowed “beaver believer” – a growing community, she says. Yes, crack open the lid on this story just a little, and you’ll find that a whole world of passionate beaver devotees indeed exists. And they are capturing more attention. 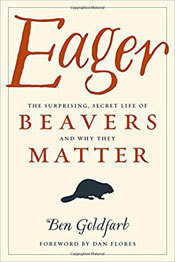 Beavers and the humans who love them have claimed a starring role in Beaver Believers, a new documentary that’s turning heads on the film fest circuit, and also in a critically acclaimed new book, Eager: The Surprising, Secret Life of Beavers and Why They Matter, by Ben Goldfarb. Beavers are figuring into dozens of media hits, and also in a PBS series. So what’s inspiring this fan base to grow, despite long-held beliefs that beavers are nothing more than a nuisance? In a word, hope. Because as it turns out, these natural engineers may well be humans’ natural allies in efforts to confront climate change. “Beavers are super hot,” said Goldfarb, who holds a masters degree in environmental management and says he’s always had fond memories of beavers. He describes idyllic scenes: hours spent watching a mated pair of beavers meticulously groom each other (“so beautiful”) in Glacier National Park, and the time he was fishing in upstate New York and one swam between his legs. In 2015, he gathered with biologists examining the transformative impacts of beavers on ecosystems they inhabit. Enlightenment struck, Goldfarb said in a phone interview. Why exactly? Let’s consider who these animals are, and how they’ve historically gone about the business of living. Recall that beavers have been popular before – as hats: Humans wiped out vast beaver populations with the fur trade a couple of centuries ago. But before that, they’d been building across North America, making dams and causing water to spread far and form complex channels, messy streams, and wetlands, even in places that are now mostly dry. Compared with the neat, straight, single-channel streams and concrete dams humans have created since, their impact on the historic landscape can be hard to fathom. As evidence, in his book he cites rampant stream erosion; loss of species dependent on vital lost habitat, from salmon to swans; and the drying-up of wetlands across the now-parched West. Beavers, from ‘favorites of the fur trade’ to one more tool in combatting climate change? But unlike other species decimated by European explorers and settlers (think passenger pigeons), beaver populations have rebounded dramatically over the years. In areas where they’re left to do their thing, beavers nowadays are once again taking up the mantle as landscape engineers, this time in a way that more humans can appreciate. Climate change is forcing people to consider new ways to protect our water supply. Concrete dams, for example, are a key piece of our current infrastructure, but they are expensive to build and maintain, and they can wreak havoc on ecosystems. Beavers, meanwhile, have dams down pat. And that’s got some people thinking. Consider California, a poster child of drought, for example. More than 60 percent of the state’s water supply comes from snowpack in the Sierra Nevada mountains. With climate change causing more precipitation to fall as rain rather than as snow, the state now experiences more spring flooding, and less water flow in the late summer and fall – a problem that will intensify as the climate warms. 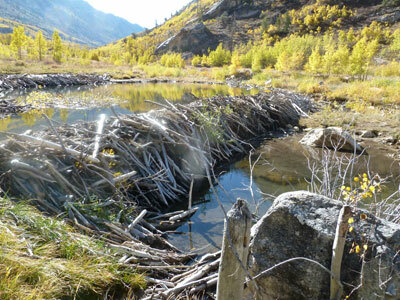 Beaver dams, meanwhile, can help avert early runoff by storing more water in higher elevations – much like snowpack historically has done. “Dams slow down water, giving it a chance to settle into the land and replenish groundwater, so it doesn’t flow down the mountains all at once,” says Guzzi. She says the water also stays cooler in areas with beavers, thanks to colder groundwater temperatures and vegetation growth associated with dams. In addition to potentially easing drought-like conditions, more creeks and wetlands could also help give wildfires a natural breaking point. And that’s just in California. Because every ecosystem is unique, beavers can have different effects on the environment depending on where they are. Beavers may also help to some extent on the climate mitigation side. That’s because organic sediment settling in beaver ponds takes with it the carbon it contains. And that increased vegetation in these richer ecosystems can also store more carbon. Other benefits are associated with beavers too, from filtering-out pollutants from waterways, to improving biodiversity. So humans and beavers may well be better together, perhaps, but only if they first can learn to get along. Beavers like the same kinds of places humans do. That common interest can lead to trouble in one’s backyard, where they may flood a garden and eat bark off a favorite tree. There are also legitimate safety concerns if a dammed culvert floods roads. 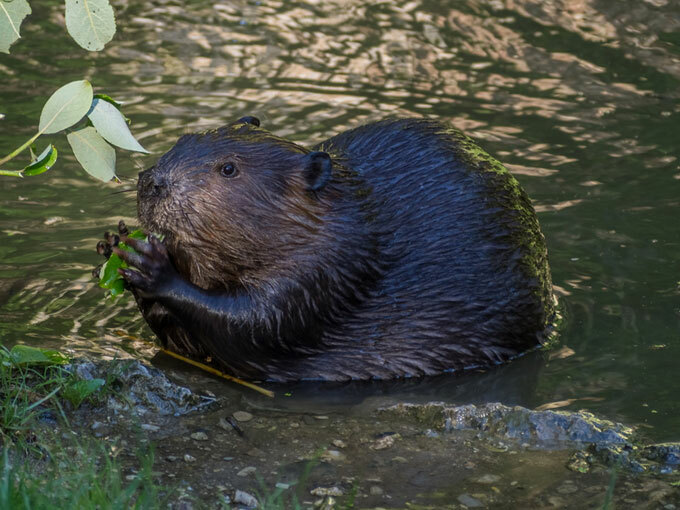 To head off these potential issues, many state agencies have generally opted to kill the beaver(s) in question, as Guzzi and her community experienced in 2010. But there also are other options for dealing with what she calls the two main concerns in the Tahoe area: tree damage and flooding. So Guzzi and her group work to educate others on those options, and in many cases, to facilitate them, too. “We’re telling people, ‘hey, we can help you – it’s easy to protect trees!” The simple fix of choice: paint mixed with sand, brushed over the base of the trunk. Apparently beavers can’t stand the stuff and avoid it, leaving the tree to go on growing. To address flooding concerns, the coalition also installs flow devices, running a pipe through the dam to trick beavers into thinking their structure is solid, while allowing some water to pass through, keeping water levels from getting too high. These devices take just an afternoon to put in place, and can then theoretically work for decades with minimal maintenance. They also cost less than “removal,” which Guzzi says is rarely a long-term fix, since new beavers often move in to a newly open spot. “It isn’t much work; the big thing is just convincing people to do it,” Guzzi says. She says that part of the job has been getting easier in general, though, as more people learn about beavers, and humane ways they can co-exist. Could beavers help you, too? Beavers may not be as prevalent in many areas as they once were. But even without swimming with one as Goldfarb did, there often is evidence of their presence. Each fall, they’re especially active, busily repairing dams and harvesting in preparation for winter. But even when they’re quietly nestled in their mud-packed lodges, beavers leave fascinating clues that they’ve been keeping plenty busy. “We don’t know what their exact contribution to climate adaptation is. But what is clear is that they’re a very useful tool in the toolbox, and one of the most cost-effective strategies at that,” Goldfarb says. He points out that they’re cheaper than many “climate-proofing” projects, like replacing failing irrigation systems, retrofitting leaky canals, or even installing low-flow toilets. “We should be doing those things, but again here’s this animal that does this stuff for free – all you have to do is not kill them,” he says. Things are more nuanced than that, but one thing is starkly clear: We need smart, out-of-the-box new ways to defend against the worst effects of climate change. Enlisting beavers in the effort could be one such way forward. They are, after all, the only other species anywhere nearly as capable as humans at transforming a landscape. But instead of simply “architecting” climate change as humans have done, the beavers’ engineering approach could help us all better weather the storm. And for beaver aficionados, that’s something worth believing in.